As our small group confidently strides past iron gates into a foliage-embellished courtyard, a bearded man in overalls gesticulates wildly. “Oof these Italians,” sighs my companion. “So dramatic. What is he saying?” Apparently, we have wandered into a private art class. “You want David,” says the man without questioning our foray and waves us off dismissively towards the left. And when we run into David at the Galleria dell’Accademia, he is more magnificent than his pictures. Michelangelo’s 1501-crafted 14-foot-tall marble statue towers above the camera-toting spectators prancing around the muscled beauty, much to the amusement of the yawning guards. While most artists sculpted the biblical hero after his victory over Goliath, the stance of Michelangelo’s David is one of that before the battle. 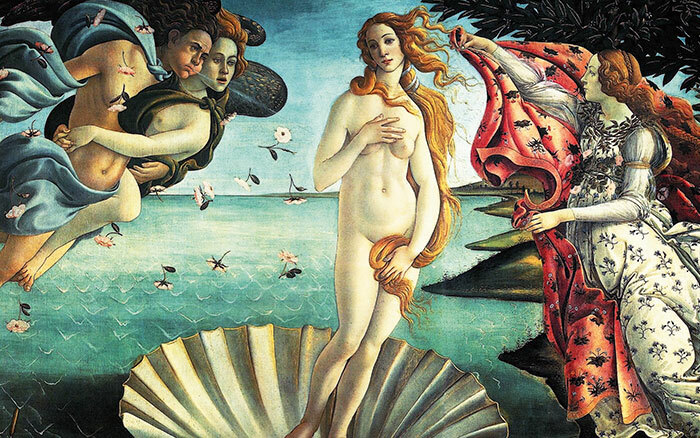 At the 18th-century Uffizi Gallery, a short walk away, we are overwhelmed by the extravagant display of sculpture on the fourth floor and have a close brush with Botticelli’s famed Birth of Venus, said to be the first example of a painting on canvas in Tuscany. Next to it is the artist’s other masterpiece, Allegory of Spring, a study in love, lust and fertility where well endowed mythological figures swirl under Cupid’s arrow in an orange grove. On the first floor of the gallery is an unmarked door that leads to a secret passageway. Most visitors will not give it a second glance but those in the know step into an intriguing time machine accompanied by a guide. The Vasari Corridor, as it is called, is a kilometre-long walk that links the Uffizi Gallery with the Pitti Palace. The passage is lined with precious artworks of the 16th and 17th centuries as well as a unique collection of self-portraits. Small circular windows look down upon the Arno river and the city centre. The corridor, named after the architect who completed it, was commissioned by the then powerful Medici family to celebrate a wedding. 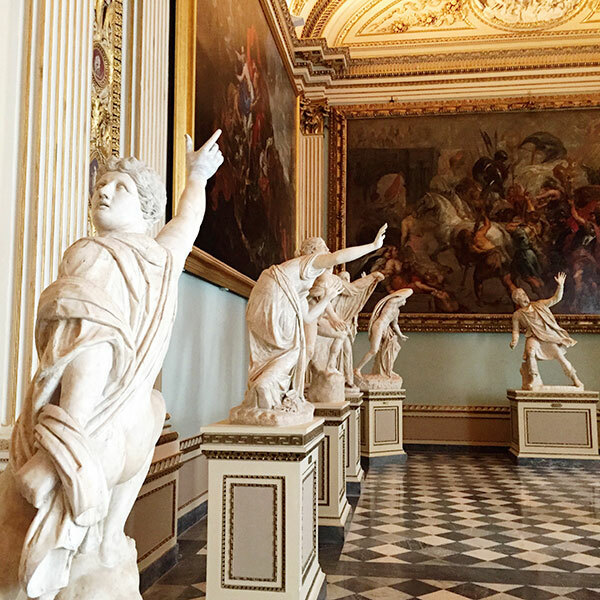 From this vantage observation point, the Medicis — who were known to move freely and safely from their home in Pitti to Palazzo Vecchio, the seat of government — could look down upon the general public while remaining fairly unnoticed themselves. Art, in fact, springs from every corner of this medieval city and I wonder if Florentians ever feel that they are living in a museum. Do they just take their historic surroundings in their daily stride while grabbing a copy of La Nazione and a cappuccino or stop and stare for a bit? I look out of my room at Portrait Firenze and am rendered speechless for a second. 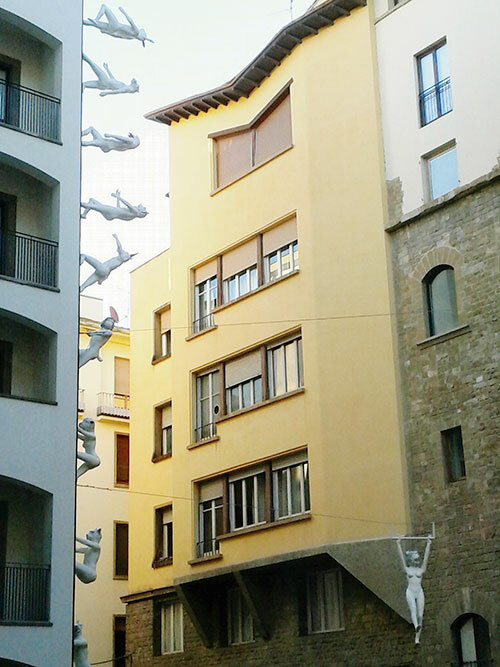 An Instagram-worthy view of a line of weird-looking creatures ascending a wall of the building across my hotel confronts me! Architect and artist Simone D’Auria’s imaginary world, populated by half-human, half-animal anthropomorphic figures are part of her latest exhibition, Personal/Unpersonal, where she plays with the concept of ‘moving forward and rising to the top’ for the newest hotel in the Lungarno Collection chain. The exhibits are inspired by the men who built the city of Florence and are represented by animal emblems such as the turtle symbolising wisdom, the rhino, strength…and more. 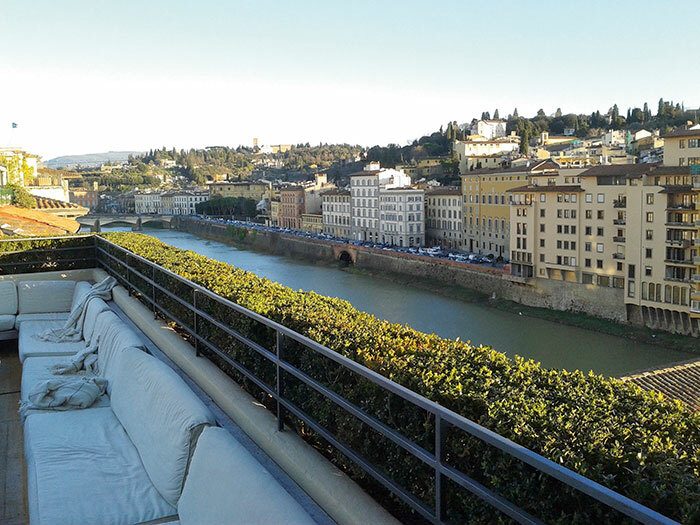 Portrait Firenze, a 34-suite hotel with a delectable view of Ponte Vecchio, stands on the historical site of the Grand Hotel Royal de L’Arno, a popular watering hole in the 1800s. Charles Dickens and Henry James were regular guests as were the master goldsmiths from the vicinity to whom Caffè dell’Oro is dedicated. The hotel, along with sibling properties, Continentale and Gallery Hotel Art, is the inheritance of the Ferragamo family, known for its passion for creative innovation and elegant hospitality. 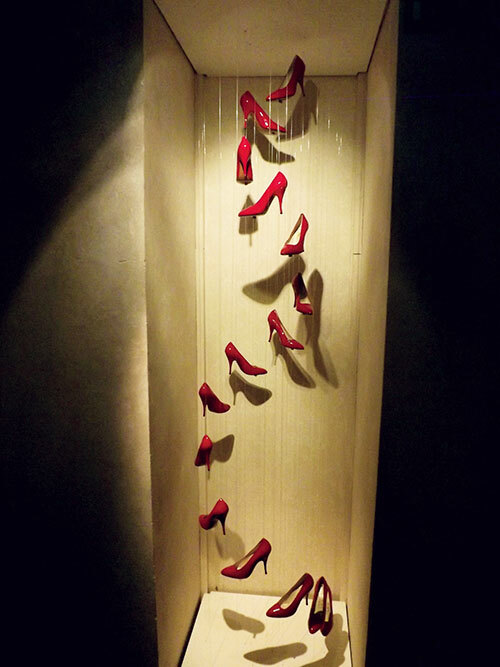 Salvatore Ferragamo, in fact, opened his first company in Italy in Florence, where his store pampered a legion of Hollywood beauties, European princesses and Italian aristocrats. A brief turn around the corner from the hotels and we reach the Museo Ferragamo housed in the lovingly restored Palazzo Spini Feroni. Equilibrium, the current exhibition, enthrals with the elements that the iconic designer laboured with the most: the importance of balance and the arch of the foot. The museum, up until April 2016, is showcasing A Palace and The City, a new project, which through private art collections and specially created sets, will relate the story of the palace and celebrate Florence, the birthplace of the Renaissance. More history wraps itself around us when we enter the 100-year-old Trattoria 4 Leoni at the quaint Piazza della Passera. The server-host bears with our useless debate at trying to decipher a menu in Italian (only) with a pretended air of sufferance, then takes pity on our translation ordeal and suggests a meal that does the chef proud. The salads are crisp, the Tuscan stew, hot and peppery, the cheesecake, all froth and fluff, and the signature dish of pear-stuffed ravioli with asparagus sauce, worth every euro against its name. Lest we wander away without noticing, the rustic-style restaurant which was born as a family-owned tavern before it changed hands, displays large photographs of celebrity diners on its stone walls. Dustin Hoffman, Anthony Hopkins, Kevin Costner, Sting….